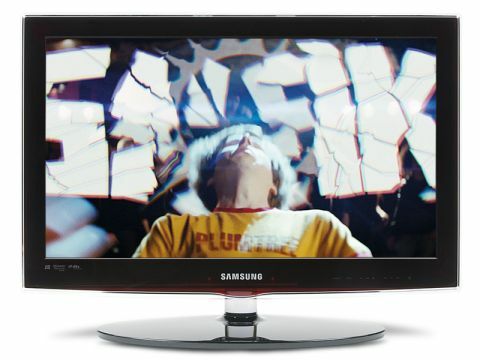 The Samsung UE26C4000PW LED-backlit LCD TV is by far the most attractive we have seen close to this price. Merely millimetres thick and finished in a seductively rose-tinged gloss black, the UE26C4000PW looks to combine high-end aesthetic swagger with mass-market affordability. The svelte profile dictates that certain sacrifices have had to be made in the socket department, but a brace of HDMIs more than makes up for the lack of Scarts, and there is an optical digital audio output to send the TV pictures out to an amplifier. The feature list is also impressive, with decoding for Dolby digital and DTS surround formats built in and the company's Connect Share Movie system for enjoying audio/visual content from USB. The user interface is a treat, with colourful, animated graphics illustrating the various menu options, a helpful plug-n-play facility to get you up and running and a logical, reassuringly large remote control. The looks and feel of the set are a lot to live up to and unfortunately the pictures fall short. Freeview pictures are a trifle crude, with some lax edge discipline and a degree of digital dross. A breezy colour palette keeps everything watchable, although tones can tip towards garish if not managed properly. Blacks, meanwhile, are decent and there is an admirable amount of detail on display. It's an exciting set, though, and a worthwhile experiment in smaller sized LED sets.